Verwacht: september 2018 Wander: The Cult of Barnacle Bay is the first game in the Wander series. 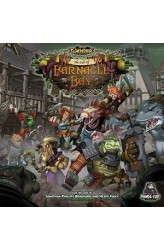 A fully cooperative, campaign-driven, miniatures board game, Wander: The Cult of Barnacle Bay tells the story of 5 heroes from the Wanderer's Guild, and their struggle to free the small fishing town of Barnacle Bay from the slimy claws of Elder Bane. Driven mad by power, and physically twisted from dark magic, Elder Bane has created a cult of mutated townsfolk that only desire to spread their message of madness to the rest of the world, bending it to their whim along the way. In Wander: The Cult of Barnacle Bay, players will select one of five unique heroes, outfit their hero with starting gear (represented by mini cards on a player dashboard), and join their friends to ta..